ABT has released the Sporty, Strong, Speedy Audi QS3. 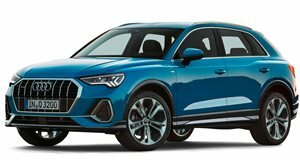 ABT showed up to the 2012 Geneva Motor Show with a tuned Audi Q3 and now we have even more details of their aftermarket program for the German crossover. Dubbed the &apos;QS3,&apos; the &apos;S3&apos; standing for Sporty, Strong, Speedy, the crossover features power upgrades such as the 177hp 2.0-liter diesel TDI engine tuned to 205hp and the 211hp 2.0-liter gasoline TFSI plant tweaked for an output of 270hp. The &apos;Strong&apos; component certainly helps the &apos;Speedy&apos; performance numbers, however the tuning company has yet to release the official details. The ABT Audi QS3 shows off its &apos;Sporty&apos; side with a very elaborate body kit. A revised front-end complete with a new and larger grille stands out prominently on the crossover. In addition, new side skirts, rear apron with integrated diffuser, roof spoiler and quad tailpipes all combine to give the model a new look. It sits on wheels ranging from 18- to 21-inches wrapped in high performance rubbers. The interior has been redesigned for maximum luxury, complete with superfluous amounts of leather, Alcantara and carbon fiber pieces. When you add up all the exterior, interior and performance changes, the ABT Audi QS3 truly is a Sporty, Strong and Speedy machine.